Over the last few years I had seen my fellow #warmongers playing Bolt Action and the game looked really interesting. Lucky for me, I finally got to play it at U-Con last November. I ended up grasping a lot of it from what little explanation I could understand, in the midst of a sinus headache and enjoyed it, for the most part. I'd been tempted to pick up the rules for awhile and check it out, but never pulled the trigger. Until about 3 weeks ago. Just before I left for Chicago, I decided to pick up the rules for Bolt Action and give them a read. I packed it in my bag and took it with me, for something to do while I was riding in the car and sitting idle in the hotel. Usually, I have issues grasping the rules to a game without having it in front of me. Which is why I always set up board games and run a solo game of it to better understand it all. This time I managed to understand the rules much better, since I was actually reading the book after playing the game and could look back on my previous experience. Instantly, I fell in love with it and knew I needed to find a way to get games going locally. A new game store has opened in town as well, and it features plenty of tables for games to be played. It lacks a following currently, along with any sort of scheduled events. But it could be promising and the owners seem like alright guys. I've been thinking about seeing if it would be possible to get some demo games running there to check interest. To run demo games, I'd need armies, and starting two armies for a system I haven't found a group for is always a scary prospect. Warlord Games sells a nice starter box called D-Day Firefight and it features US and German troops as well as a Half-Track truck for the Germans. I had been eyeing that for awhile, but knew I'd need to wait for a bit to get it and was planning to snag it after I finished Blood Rage. 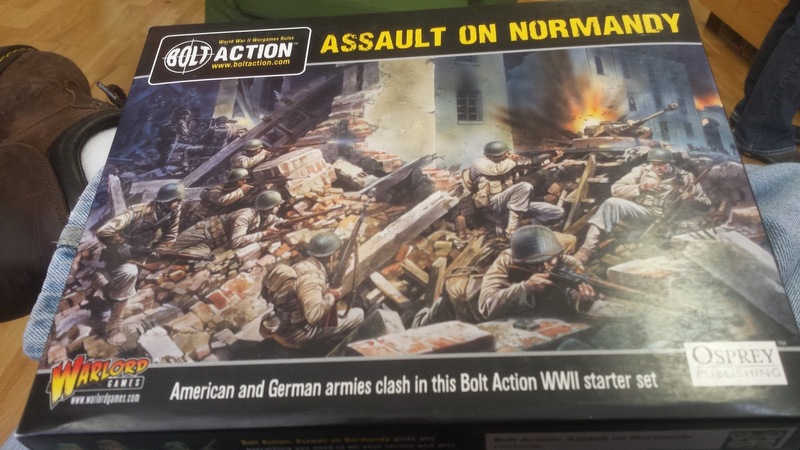 While in Chicago we hit up a store called Dice Dojo and while wandering around looking at all their products, I rounded a corner and was faced with a wall cabinet filled with Bolt Action goodies, one of which was another starter set called Assault on Normandy, which includes 20 of each US and German troops and a pair of ruined buildings. I had some extra cash left over, since it was the last day in town, and after a bit of a hobby wobble, I ended up grabbing a copy. 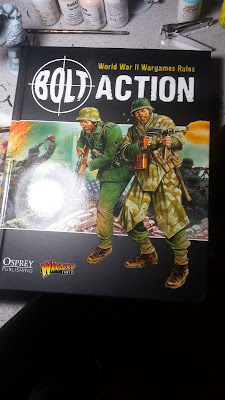 During this time, I was talking to a couple of friends on Twitter about Bolt Action and one mentioned an event they hold each year called "Gathering in the Desert", which is a 2 day Bolt Action event, and how i should find my way there to join in. The hype train was running full steam and I ended up snagging the Armies of the United States book and a box of US Rangers too. I've always been a fan of the Rangers, especially after reading about the Pointe du Hoc operation by the 2nd Ranger Battalion during D-Day. It was a tough call between going with Airborne or Rangers for my army, as I've always been interested in both of their exploits during the war. 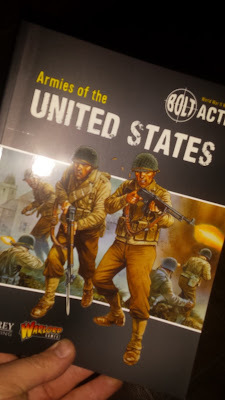 But, I finally decided and now plan is to build up an army of US Rangers, build up the Germans, run demos locally and possibly take my US boys to Arizona next February/March for the event. It all depends on if I can swing the funds or not. 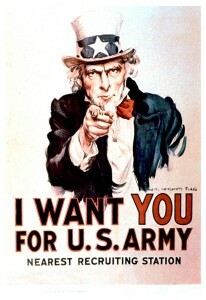 But it'd be a blast, especially since this year's theme is D-Day.